(Nanowerk News) PI's new A-341 hybrid gantry XY/XYZ positioning stage provides the framework for controlled precise overhead motion that is often sought after for 3D printing, assembly, pick-and-place, alignment, inspection, and industrial automation applications. The A-341 HGS hybrid gantry is designed to combine maximum throughput with smooth and highly accurate motion in a compact envelope. 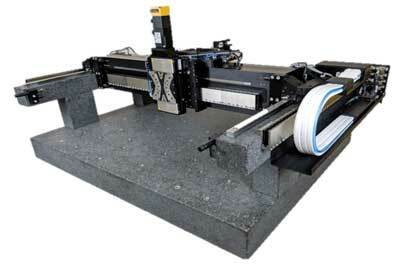 PI's A-341 hybrid gantry XY/XYZ positioning stage. PI's novel gantry features a unique hybrid bearing design. The cross axis utilizes a frictionless air bearing guiding system, which allows for excellent velocity control, repeatability, straightness, and cleanliness. The lower dual-motor axis uses precision mechanical linear bearings for rigidity and reduced size. This combination of bearing technologies offers an overhead gantry motion platform optimized for step and scan applications in the smallest possible form factor. Absolute measuring encoders render homing procedures unnecessary and ironless linear motors eliminate cogging, providing smoother motion without vibration and better velocity control. An optional vertical axis (Z-stage) with either ballscrew drive or linear motor and pneumatic counterbalance can be integrated with the gantry cross axis. The HGS Gantry is coupled with industry-leading ACS controls and drives that offer superior servo performance, advanced control algorithms to improve dynamic performance and error compensation specifically for gantries, and a wide suite of software development tools.